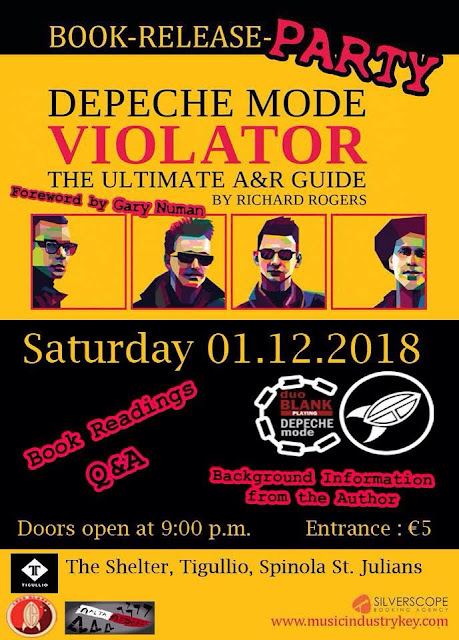 The new book "Depeche Mode - Violator: The Ultimate A & R Guide" will be presented at The Shelter - Tigullio St. Julians. "Violator" is still the best-selling album of the synth pop band Depeche Mode. Richard Richard Rogers, the author of the book and A & R Man (Artist & Repertoire), provides a guide to the album from an A & R point of view. There will be readings from the book, providing background information on the development and the author shall be available for a question and answer session. The foreword by Gary Numan will be presented so to tell something about his point of view on the album "Violator". On request, the author likes to sign the book and talk to the guests. Once again we shall dance the night away to a night of Depeche Mode played by our traditional DM Djs DUO BLANK! Entrance Fee: €5 at the door.